The Chinese iOS App Store is host to a popular app about a traveling frog. But, as innocent as it may sound, the app is raising some alarming questions about Apple’s App Store policies in China. 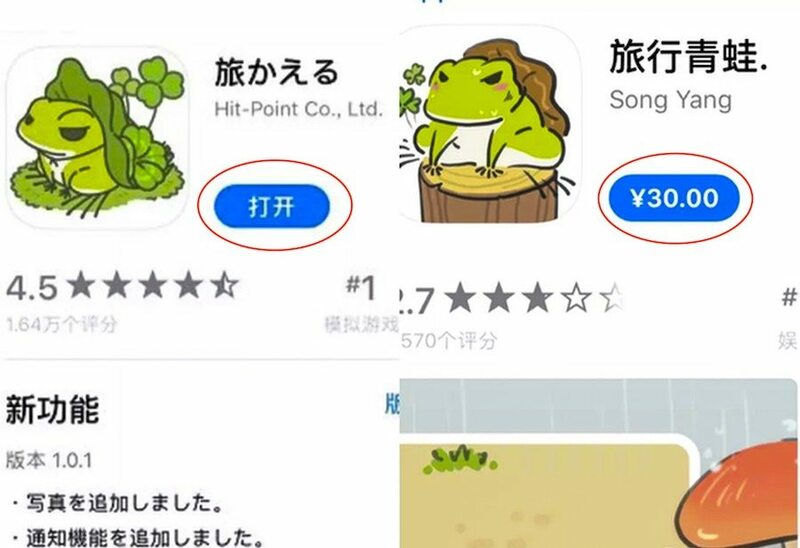 The app in question is actually a Japanese app called Tabi Kaeru, or “Travel Frog.” But while the app may have originated in Japan, Tabi Kaeru has become an unexpected viral hit in China. It’s so well-known, in fact, that the New York Times profiled the app’s rise to popularity earlier this month. Tabi Kaeru’s premise is a simple one. It features a digital frog that requires regular care and feeding from its “owner,” but the main draw of the app is the frog’s random traveling. Periodically, the frog will leave on trips and bring back virtual souvenirs for users. As the Times points out, the app appears to have struck a chord with Chinese mobile gamers. Its appeal lies in its ease of use, as well as its offering of digital companionship and vicarious adventuring. Tabi Kaeru has risen to the top of the App Store game category in China, and players regularly discuss the app on social media and post pictures of their frogs’ travels. But what could have been an app success story is being undermined by something else entirely. The app’s sheer popularity is raising concerns that Apple doesn’t pay as much attention to its Chinese App Store as it does to platforms in other countries. While Apple is well-known for its strict app vetting, there’s evidence that this process isn’t nearly as stringent in China. According to research conducted by marketing firm China Channel, more than 30 knockoff apps mimicking Tabi Kaeru have been accepted into the Chinese App Store. Worse still, the most successful fake app seems to have made a ton of money for its creators, TechCrunch reported. The fake app was accepted on Jan. 22 as a paid download, and a combination of factors allowed it to surge to the top of the paid-app category for about 10 hours before it was removed. After Apple’s 30 percent cut, the fake app has probably made its developers around $100,000. That’s concerning since the authentic Tabi Kaeru is free. The implication is that there’s a gap in Apple’s vetting process in China. This may be due to a lack of cultural understanding among U.S.-based App Store reviewers, but some developers have even speculated that the company is outsourcing its China App Store vetting process to a local third-party. Of course, this is problematic for a number of reasons, but particularly because China is the world’s largest smartphone market — and it’s still rapidly growing. It’s also Apple’s single largest market for app revenue. Shortly after TechCrunch broke the story, Apple reportedly removed all Tabi Kaeru knockoffs from the App Store. The company didn’t respond to TechCrunch’s questions about the vetting process but confirmed that it had removed the apps and referred the publication to its App Store Review Guidelines — which prohibit plagiarization. But the important question that remains is whether the Tabi Kaeru incident was a one-off issue, or if it just revealed a more widespread problem. Either way, for the sake of users and developers everywhere, Apple would do well to better police its own ecosystem — and hopefully, this simple app about a traveling frog has served as a wakeup call.